Southern California has had an unbelievable saltwater season thus far. The whispering of El Nino has brought not only warmer water than usual, but schools of tuna in multiple varieties. 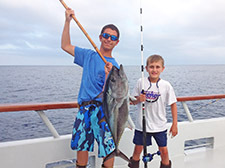 The San Diego angling community has debatably been able to take advantage of this epic bite more than any other part of Southern California thanks to the availability of Mexican fishing grounds. Before the start of the season, many anglers were worried that they wouldn’t have access to Mexican waters do to issues regarding permitting and fishing requirements. On eve of the season, the Sportfishing Association of California in conjunction with several local and federal politicians worked out a solution that allowed boaters and anglers alike easy access to Mexico. All seemed resolved and optimistic until the present. 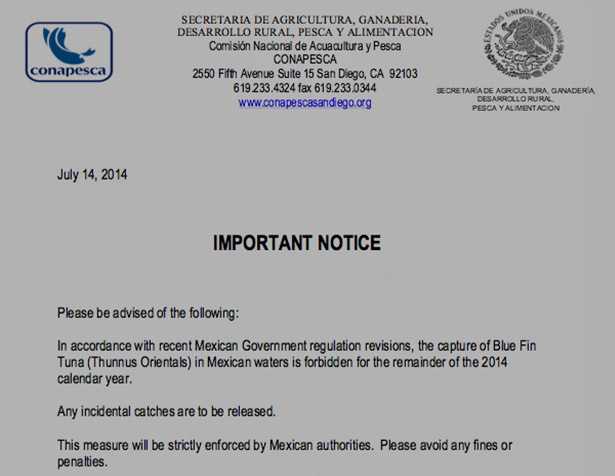 Yesterday late afternoon, CONAPESCA which is the agency that manages Mexico’s fisheries issued a very brief press release announcing that all take of bluefin tuna by both the commercial and recreational fishery is now closed for the rest of 2014. This comes as a surprise to many in the fishing community as there has been no indication that the pacific Bluefin fishery has been depleted. Mexico’s press release gave no indication as per the reason of the closure, but it did state that there would be penalties for those who do not abide by the new regulations. Currently the Inter-American Tropical Tuna Commission (IATTC) is in session and it is supposed that Mexico will give a more detailed explanation of their actions there. While this kind of action is uncommon, it is within Mexico’s rights to regulate their territorial waters. One can only be grateful that the yellowtail and yellowfin bite is abundant as bluefin tuna are no longer in our future.